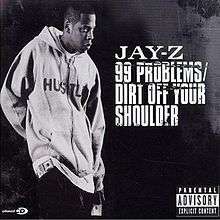 (2003) "Dirt Off Your Shoulder"
"Dirt off Your Shoulder" is the second single released from Jay-Z's 2003 album The Black Album. In 2004, the song was combined with the Linkin Park single "Lying from You" and released as a single for the mash-up album Collision Course. The track references the first bars of Scarlatti's Sonata in F minor, although the time signature is changed. On April 17, 2008, Democratic presidential candidate Barack Obama referenced the song in gesture, in response to sharp attacks from his rival Hillary Clinton and a debate which was widely criticized for focusing on campaign gaffes rather than on candidates' policy positions. Referencing his opponents' "textbook Washington" tactics, focusing on personal attacks and trivial issues, Obama used Jay-Z's hand signal to "brush the dirt" off his shoulders. When asked whether Obama was deliberately referencing the song, a campaign spokesman said, "He has some Jay-Z on his iPod." Clinton later made the same gesture during her appearance before the House Select Committee on Benghazi. ↑ Kurtz, Howard (2008-04-18). "Performance By ABC's Moderators Is a Matter Of Debate". Washington Post. Retrieved 2008-04-18. ↑ Whitcomb, Dan (2008-04-18). "ABC criticized for handling of Democratic debate". Reuters. Retrieved 2008-04-19. ↑ Melber, Ari (2008-04-17). "Obama Meets Jay-Z in YouTube Mashup Slamming Clinton & Debate". The Nation. Retrieved 2008-04-18. ↑ Wiltz, Teresa (2008-04-19). "Obama Has Jay-Z on His IPod and The Moves To Prove It". The Washington Post. Retrieved 2008-04-19.